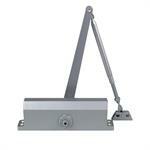 Door Closer Accessories for Series 50 in Silver or Brown finish. Ideal for retail storefronts, cafes and clinics. ANSI Grade 1 durability and performance. ADA compliant.